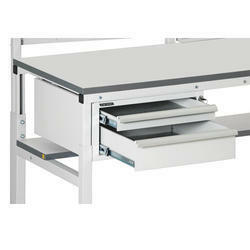 We offer quality range of Anti Static Work Tables / Work stations, for various design please click on this category. these tables are designed by our technical person on the clients requirement and we make both MS powder coated or Aluminum profile, with ESD Laminated tops, with branded electrical fittings, and other accessories like drawing board, pin board. grounding buttons, grounding cables, drawers. cabinets, back panel, side panels, foot rest and common grounding points.